We all scream for ice cream! 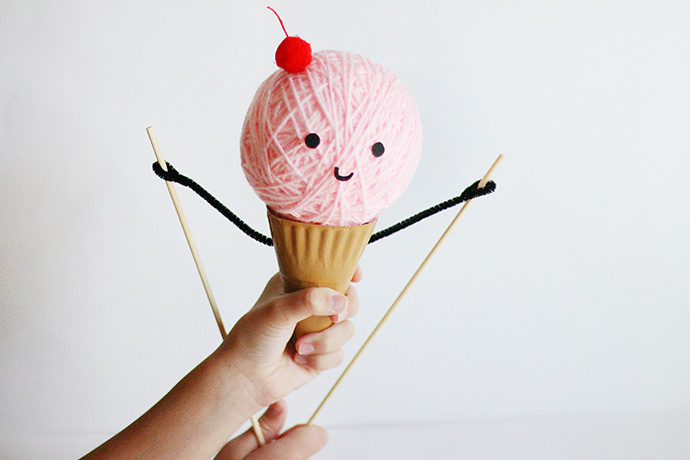 This DIY puppet combines a few of our all-time favorite things: ice cream, handmade puppets, and paper plate crafts! We had so much fun putting this guy together – isn’t he the happiest little ice cream cone that you’ve ever seen? Plus, you probably have all the materials needed to get started on this sweet puppet. And if you have a few different colors of yarn, even better! 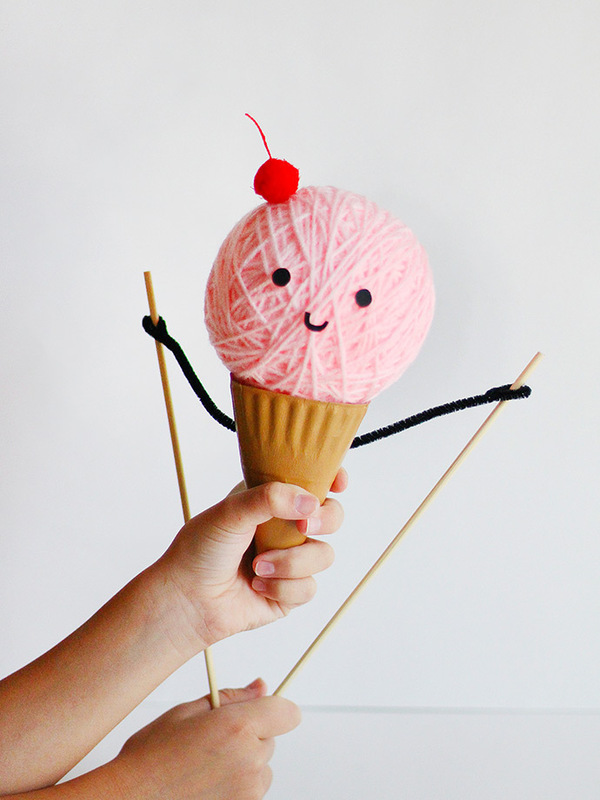 Make a whole bunch of these puppets using different yarn to have a whole ice cream parlor’s worth of flavors. Cute! Watch the instructional video below, and scroll down more for all the written instructions. Now let’s get crafting! Begin by cutting a paper plate in half and rolling into a cone shape. You’ll want to use the super thin paper plates from the dollar store for this – if the plate is too strong, it might not roll as smoothly. Use hot glue to secure the plate into the cone shape – make sure that the foam ball sits nicely on top of the cone too! Once the cone is assembled, apply a coat of paint onto the paper plate. We used Classic Caramel from our Apple Barrel Acrylic Craft Paint set. Let dry. While the paint is drying, you can make your ice cream! 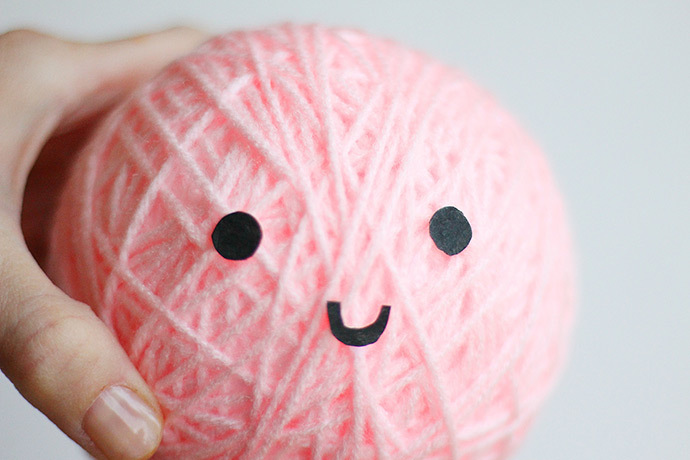 Simply wrap yarn around a styrofoam ball and keep wrapping until the ball is covered completely. Use a tiny dot of hot glue to secure the yarn tail if needed. Then cut a cute face out of black paper and use hot glue to attach to the ice cream scoop. Adorable! Time to add some arms! Use the tip of your scissors to poke a hole on both sides of the cone where you’d like the arms to be. Then just grab a full-length pipe cleaner and thread it through the poked holes. 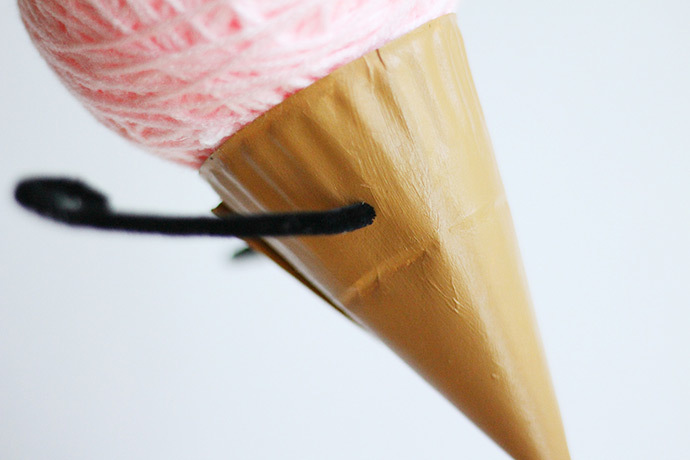 Use the hot glue gun to attach the yarn-covered ice cream onto the painted cone. Bend the pipe cleaner hands into little loops around the top of two wooden skewers and use a little bit of hot glue to secure in place. And now for the cherry on top … literally! 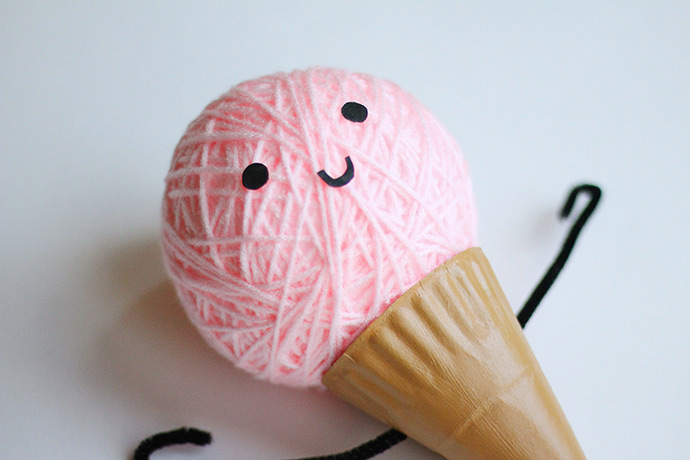 Glue a mini red pom pom onto the top of the yarn-covered ice cream scoop. 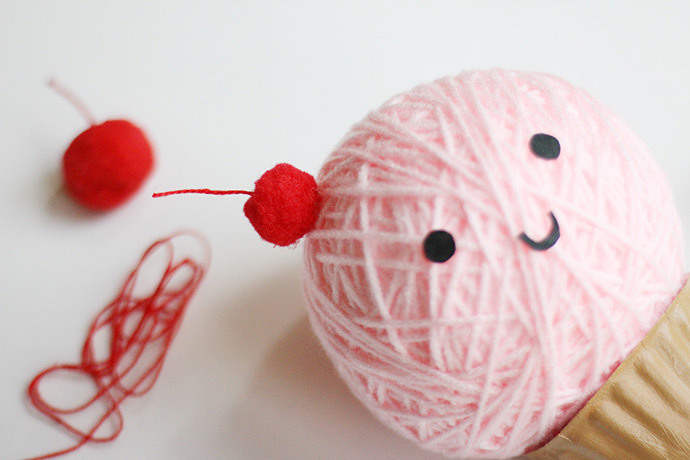 Cut a piece of red string about 1″ long and use the tiniest dab of glue to secure it to the pom pom, forming a stem. And that’s it! Have fun playing around with your new ice cream cone puppet. 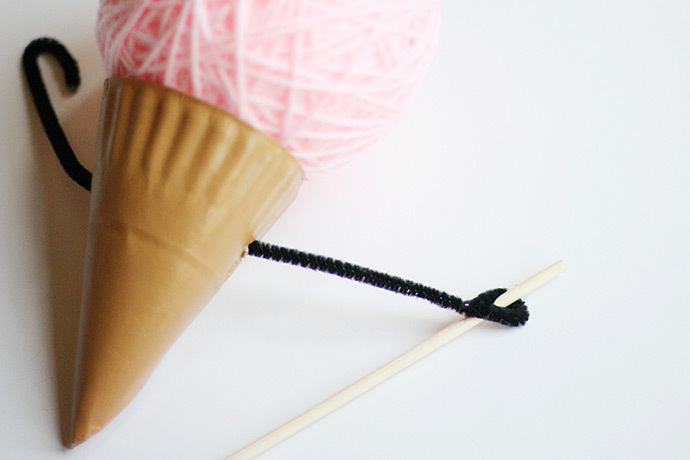 Why not use different colors of yarn and make a whole group of ice cream cones in fun flavors?? 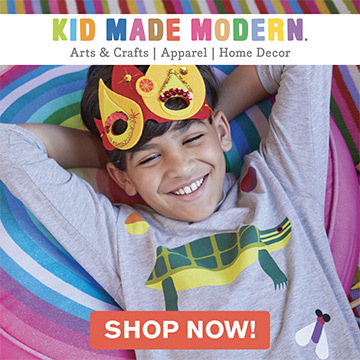 Want even more ice cream crafts this summer? Check out these pom pom ice cream necklaces, these fun backpack charms, and these colorful ice cream party favors!